Winn Manufacturing, Inc. through the years has purchased CNC machining centers and CNC turning centers to produce the machined parts that our customers need machined on a regular basis. The following is a short explanation of the capabilities of our CNC machine shop. Two of these machines are designed for mid to high volume production. They are both categorized as high speed machines and both have work pallet changers. We are able to do job changeovers quickly on these two machines because we have designed our fixturing for these machines to allow change over from job to job to be quick and easy. This lets us fit in short run jobs, and maybe a rush order, onto equipment that is working on a longer production run. This allows us to adapt to emergencies and short lead times. Two of our CNC machining centers are horizontals with a pallet changer. These machines lets us work on four sides of part with one set-up. Some parts need to be produced on this type of machine, to be able to give the customer the accuracy requirements of the part. One machine has a 50 tool storage chain and one has a 40 tool storage chain. Two of our CNC machining centers are vertical single table machines. One of these is a heavy duty machine with a work envelope of 50″ by 30″. The other CNC vertical is a smaller machine with a work envelope of 20″ x 10″ . Both of these machines we use for short runs jobs with lot sizes of 1 to 50 parts. Winn Manufacturing understands that our customers need fast turnaround and economical pricing. We have made a commitment to purchase enough tool holders that are used on our CNC Machining Centers so that we can keep the tooling set-up and on the shelf for our repeat jobs. This keeps our part pricing down, short delivery times and it also leads to more consistent quality with your parts because the tooling is set-up the same from lot to lot. Two of our CNC Lathes the capability of turning up to a 16″ diameter by 32″ long. These two machines are capable of removing large amounts of metal quickly. One has a 40 HP spindle and one has a 50 HP spindle. The third CNC lathe has a 10″ diameter capacity and is designed to produce smaller parts with larger lots sizes. All of our CNC lathes are able to hold the tolerances that are used for standard bearing fits that are used in the manufacturing industry. We have adapted the same concept with our CNC turning equipment. We have enough tooling and tool holders to keep much of the tooling set-up. This lets us do changeovers quickly. We work on sand castings, permanent castings, investment casting and die casting. Most of the materials we currently machine are cast iron and cast aluminum. We have the capability of machining most metals. On our machining centers, our work varies from simple drilling and tapping of castings to complex machining with tight tolerances. Because of our years of experience with machining castings, we understand how part fixtures need to be designed and build to produce consistent and accurate parts. So, we design and build almost all of our part fixturing on site, but will use supplied fixturing. 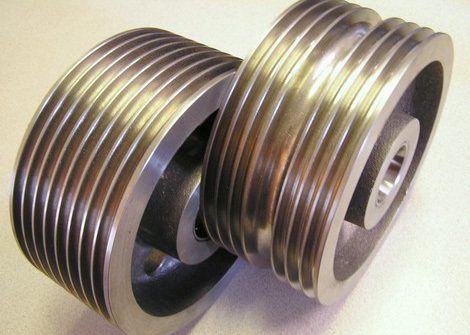 Through the years the type of work we do on our CNC turning centers has been mainly cable and rope sheaves. We do many styles of deep and multiple groove cast iron, steel and nylon sheaves that range in diameter from 3″ to 16″ diameter. We also machine many steel shafts from bar stock, that range from 3/4 to 3″ in diameter with lengths up to 22″ long. Winn Manufacturing has many outside sources that we use to supply our customers with additional services. We have companies that we can purchase steel burnouts, castings, powder coat painting, wet painting and various plating. Our customers can make one purchase from us, versus outsourcing multiple services for a single component. How can Winn help you? 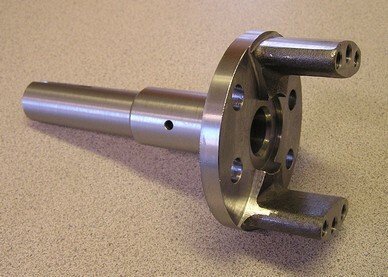 Let Winn Manufacturing assist you with our extensive machining capabilities. Machined on a CNC lathe in two operations. Both parts are 8-1/2″ diameter x 3-3/4 wide with different groove configurations. 1045 steel forging. CNC turned. The milling, drilling and tapping was done on a CNC vertical machining center.